We move back to “normal” programming with something special to share. 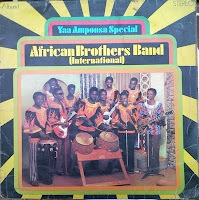 Fans of the African Jazz Pioneers might jump a bit to Hellfire, sorry about that Jannie, Jasper and crew, but this vinyl is 52 years old! Shay Utshane played by the African Swingsters more than makes up for it, I hope. The Dark City Sisters slip in with a pre-mbaqanga harmony, while Phata Phata gets regal treatment from the Brown Cool Six! Susan and the Honey Bees sound as sweet as their name! Just do yourself a favour, download this album, you will listen to this gem more than once! Thanks Siemon. The Cape Jazz Collection is a new publication from sheetmusic.co.za containing 39 lead sheets with melody and chords, of compositions connected to Cape Town, including works by Robbie Jansen, Jonathan Butler, Bheki Mseleku, Chris McGregor, Basil Coetzee, Winston 'Mankunku' Ngozi, Errol Dyers, Mark Fransman and Hilton Schilder. Sailors on ships that docked at Cape Town harbour were the first to bring jazz and Latin music to the city. They brought vinyl records, and found a local audience eager for this new music from across the Atlantic. Local musicians quickly learnt the techniques of jazz improvisation and started incorporating these into local musical styles. 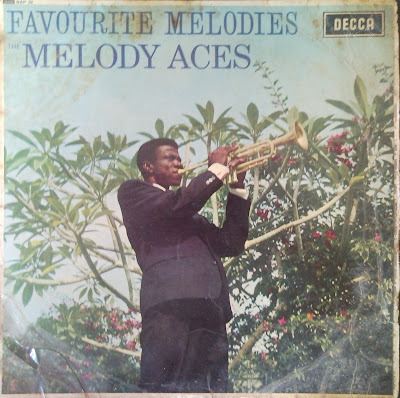 Thus began a new genre of music, today known as Cape Jazz. The Cape Jazz Collection celebrates this music of jazz musicians from the southern-most tip of Africa. The Collection was compiled by Colin Miller who studied jazz at the College of Music, University of Cape Town. 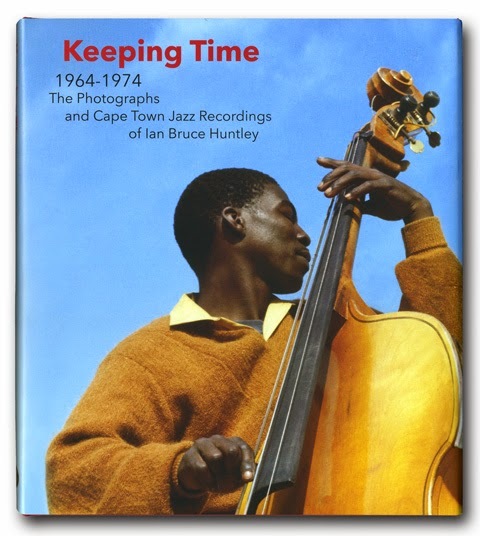 He has been extensively involved in the research and documentation of life histories of jazz musicians in Cape Town. He is Deputy Head of Pro Helvetia in Cape Town, where he is responsible for music and literature projects for the Swiss Arts Council. Colin was assisted on this project by musicians such as George Werner, Jannie Hanepoot van Tonder, Jasper Cook and Kesivan Naidoo. Every effort has been made to remain authentic to the cited recordings, while presenting the material in a format easy to use by students and enthusiasts. The Cape Jazz collection is already in use at universities and schools in South Africa, Europe, UK and the USA. Sheetmusic.co.za is working on developing a library of South African jazz charts, including 'real book' style publications like the Cape Jazz Collection, and full professional quality Big Band scores (& parts) of music of the great South African composers. 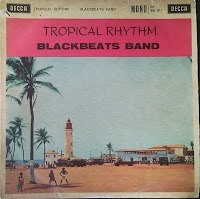 This includes tunes by Zakes Nkosi (who was the main inspiration for the African Jazz Pioneers), Dollar Brand, Errol Dyers, etc. All big band scores have been performed and some recorded, where possible these recordings are made available for download. 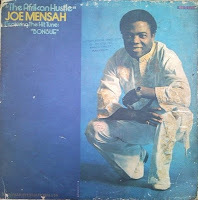 Before we share some more South African gems with you, we could not resist departing from our “normal programming” to bring you one or two fine examples of African musical “cross-poly-nation”. 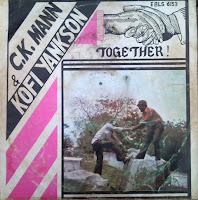 A working visit to Ghana last week enabled a quick dig in Accra – thanks Frank, Amansan Komtour (right) came through with a pile of classic Ghanaian records. 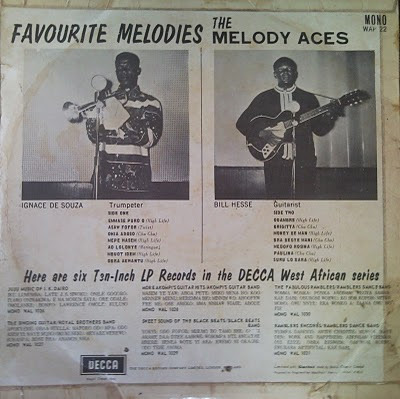 The sixties was certainly a period in which African musicians increasingly explored and crossed boundaries. 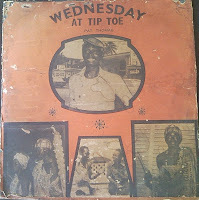 The twist took hold as much in West Africa as in Southern Africa. 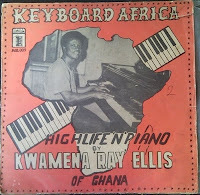 If you have enjoyed the kwela and phata phata offerings, then you will not be sorry for trying out the Ghanaian records coming up. Or perhaps, a mix selected from the pile? 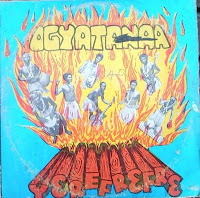 Originally from Benin, Ignace De Souza absorbed, adapted, blended and developed multiple musical styles – from his much-loved twist hit “Asaw Fofor”; through cha cha, afrobeat, but particularly Ghanaian highlife. 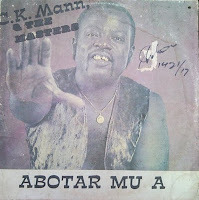 De Souza not only introduced Ghana to what eventually became known as Soukous, it is said he also wrote the first afro-beat song. 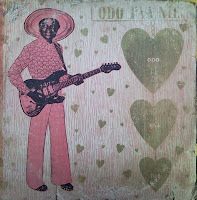 If you want more of Ignace De Souza, be sure to pay a visit to the the fantastic blog Oro. 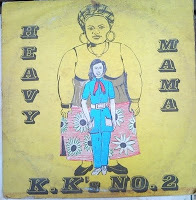 If you are interested in purchasing these collectors’ items, EJ will be shipping the LPs from Durban over to our friend Matt at Matsuli (beginning of May) who will make them available. Interim enquiries to recordforthe at gmail dot com. 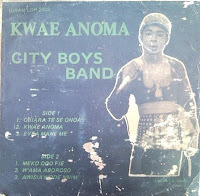 For the diggers: Amansan Komtour runs a small tourist-oriented stall outside Accra's main post office - he sells drums and clothes. His record collection is kept elsewhere. He also spends a lot of time visiting villages and collecting records. Amansan has a good idea of the value of his finds on the internet, but you will find those hard-to-find gems, and you can always make a fair offer. 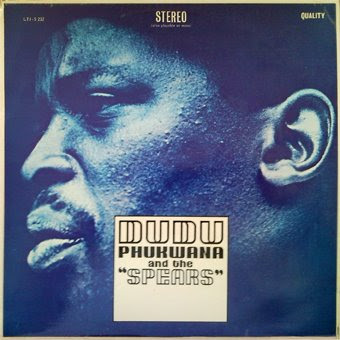 One for Charlie - Dudu Pukwana and the "Spears"
Special dedication to Charlie Gillett, who left us this week. 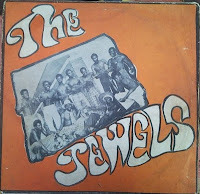 This holy grail LP first appeared at Matsuli and was re-loaded by inconstant sol just this week. 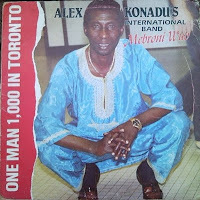 For many years the very existence of this LP was doubted but matsuli uncovered a copy and made the share last year. 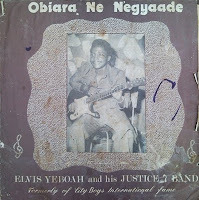 At electricjive we found a second battered copy in December in Pretoria. 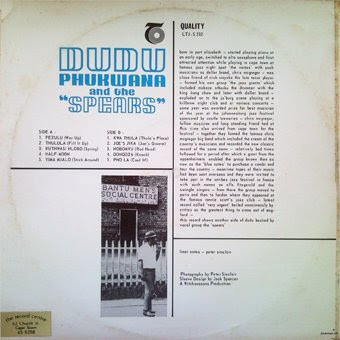 This is the debut LP from Dudu Pukwana as a leader. Recorded in the UK in May 1969 and including Richard Thompson on guitar. For further reading on Dudu and his jazz compatriots The Blues Notes I suggest heading over to Mike Fowlers excellent Blue Notes website. 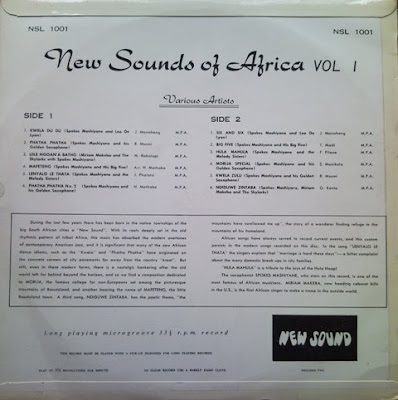 Another undated early sixties compilation featuring Spokes Mashiyane on saxophone, and Miriam Makeba and the Skylarks. Well worth a listen! 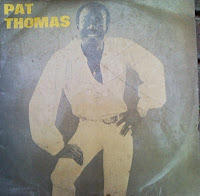 Thanks a plenty go out to Bra Robs from Italy for his generous donation of this perfect quality vinyl to ElectricJive. 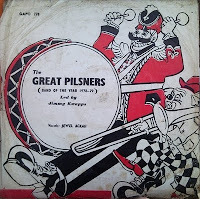 From the back-cover aimed at a European audience: “During the last few years there has been born in the native townships of the big South African cities a “New Sound”. 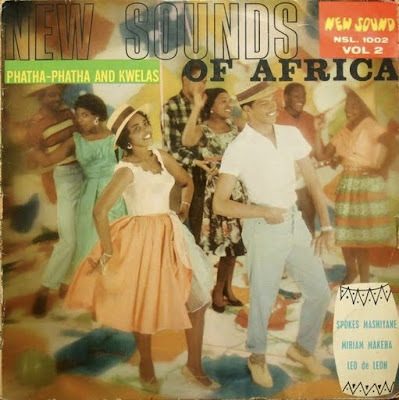 With its roots deeply set in the old rhythmic pattern of tribal Africa, this music has absorbed the modern overtones of contemporary American Jazz, and it is significant that many of the new African dance idioms, such as the “Kwela” and “Patha Patha” have originated on the concrete corners of city pavements far away from the country “kraal”. But still, even in these modern forms, there is a nostalgic hankering after the old world left far behind beyond the horizon, and so we find a composition dedicated to MORIJA, the famous college for non-Europeans set among the picturesque mountains of Basutoland, and another bearing the name of MAFETENG, the little Basutoland town. A third song NDIDLIWE ZINTABA, has the poetic theme, “the mountains have swallowed me up”, the story of a wanderer finding refuge in the mountains of his homeland. 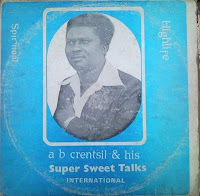 "African songs have always served to record current events, and this custom persists in the modern songs recorded on this disc. 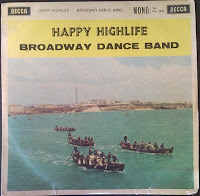 In the song “LENYALO LE THATA the singers explain that “marriage is hard these days” – a bitter complaint about the many domestic break-ups in city families. “HULA MAHULA” is a tribute to the joys of the hula hoop! 1. Kwela Du Du (Spokes Mashiyane and Leo De Lyon) J. Monaheng. 2. Phatha Phatha (Spokes Mashiyane and his Golden Saxophone) R. Msomi. 3. Uile Ngoan’a Batho (Miriam Makeba and the Skylarks with Spokes Mashiyane) M. Rabotapi. 5. Lenyalo Le Thata (Spokes Mashiyane and the Melody Sisters) J. Phalatsi. 9. 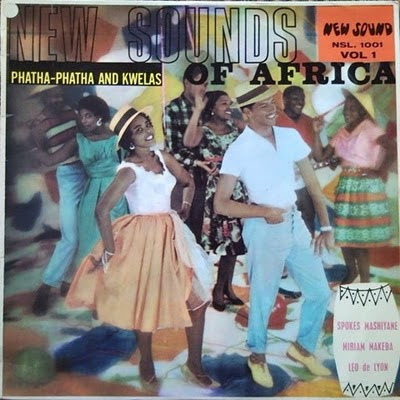 Hula Mahula (Spokes Mashiyane and the Melody Sisters) F. Phalane. 10. Morija Special (Spokes Mashiyane and his Golden Saxophone) S. Manikela. 11. Kwela Zulu (Spokes Mashiyane and his Golden Saxophone) R. Msomi. 12. Ndidliwe Zintaba (Miriam Makeba and the Skylarks with Spokes Mashiyane) Gibson Kente.